After much late-night meals, birthday lunch, dinner and cake, I haven't been able to control my diet well enough for the past three weeks. A slight increase in my body weight raised the alarm bell in me. NOOOOO!!!!! Thus, starting this week, I've made a resolution to go on a fruits-and-vegetables diet with margin for wholemeal bread and lean meat (high quality protein) for at least one whole week. At the end of this week, depending on the results, I'll then determine the next course of my eating pattern. :) Yes, I'm paranoid about my weight. 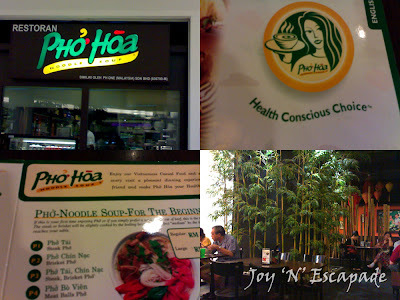 Pho Hoa, a Vietnamese restaurant seems to be the best choice for dinner when I paid my virgin visit to Tropicana City Mall. Address: Lot L1-52, First Floor, Tropicana City Mall. The Vietnamese cuisine is famous for using herbs, such as basil, coriander, mint leaves, and curry in their dishes. Most of their noodle dishes are prepared in clear broth with less oil, unless you request for extra oil in your noodles, and garnished with lots of herbs. The tagline "Health Conscious Choice" drew my immediate attention. Good. I know I didn't come to the wrong place. There was also quite a number of elderly people dining at this restaurant. Haha... I guess more and more people are becoming health-conscious nowadays. Goi Bo Bap Cai or Vietnamese Classic Beef Salad is basically a cabbage-and-beef salad with cabbage and carrot slices, lean steamed beef slices, coriander, basil, mint leaves, and crushed groundnuts. Sprinkled with some kind of sourish dressing, this salad is pleasing to both eyes and palate. Less oil too! In fact, beef is part of the main attraction in the Vietnamese cuisine. You can't say you've tried Vietnamese food unless you've consumed any of its beef-based dishes. Cha Trung Hap or Vietnamese Egg Cakes is a kind of home-style Vietnamese steamed chicken egg pie (quoting the menu). The name might be a little bit misleading because you can't find flour dough in the dish. In fact, you'll find a compact cake of minced chicken meat wrapped with a thin layer of egg. Less oil, firm, and very delicious! I'll plan for my next visit here and try out its wide range of noodles.